Runaway Bay is one of the most suitable names for this beautiful resort in Jamaica which has a “get away from it all” feel. Holidays to Runaway Bay are set on superb white sand beaches in a tranquil resort that still has Jamaica’s most popular attractions close by. The beaches in Runaway Bay are much quieter than the other resorts of Jamaica, the soft white sands offer a spot to escape everyday life and chill out enjoying the warm Caribbean sunshine. The most energetic activities on the beach tend to be walking into the beautiful crystal clear waters and having a swim, a snorkel or just splashing around with the kids. Try scuba diving or a round of gold on one of the nearby courses. Runaway Bay holidays are a good choice for families or couples who want to chill out and experience the slower pace of life on Jamaica. 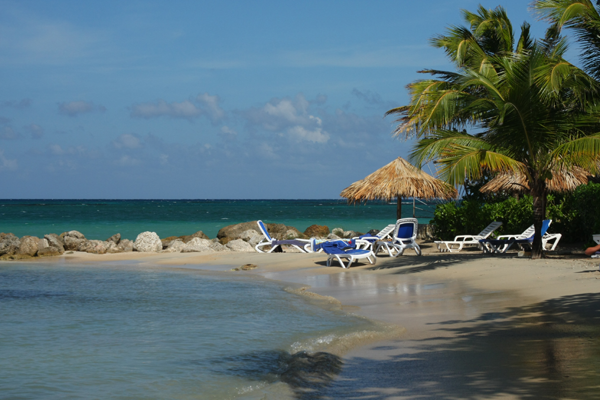 Busier beaches with water sports are available close by at resorts such as Ochos Rios. Evenings are generally laid back with a selection of bars that play reggae music late into the night and most of the entertainment is hotel based, however Ochos Rios and Montego Bay are easily reached by taxi for a bit more nightlife including music bars and clubs. Escape to your own little piece of tropical paradise with one of the hundreds of low cost deals on offer to Runaway Bay. Holidays are available now from airports around the UK, so why not call one of our friendly team who can help you find the right deal for you.